Before the Clippers and Knicks tipped off, ESPN broke down the shooting habits of Carmelo Anthony. Typically, right-handed shooters prefer to be on the left side of the court because they can take it to the hole with their strong hand. 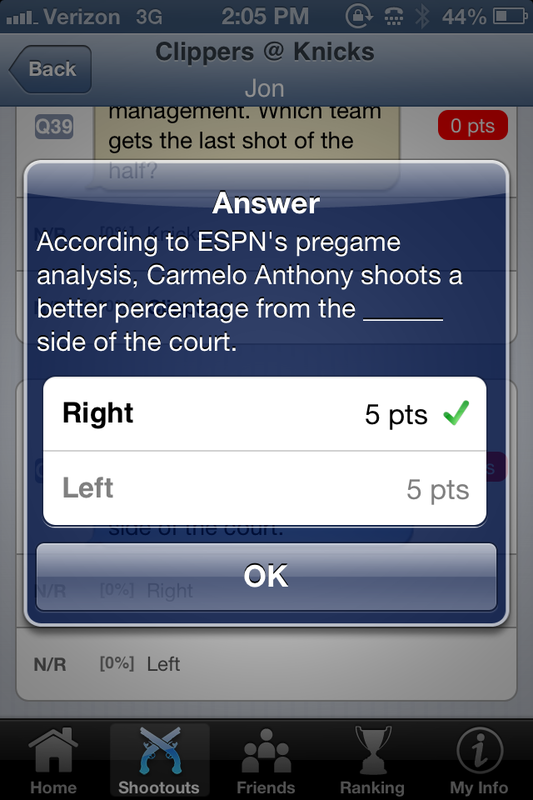 However, as a righty, Melo shoots a far higher percentage from the right side of the court. Don't worry though, Knicks fans, Melo clearly knows what he's doing. He's one of the league's best shooters in the NBA, ranking 10th in the league among small forwards. As this SnapCall demonstrates, Carmelo's shooting tendency remained consistent throughout today's game against Los Angeles. Do your homework and you can shut down Carmelo Anthony AND dominate SnapCall. SnapCall Sports is free on the App Store.